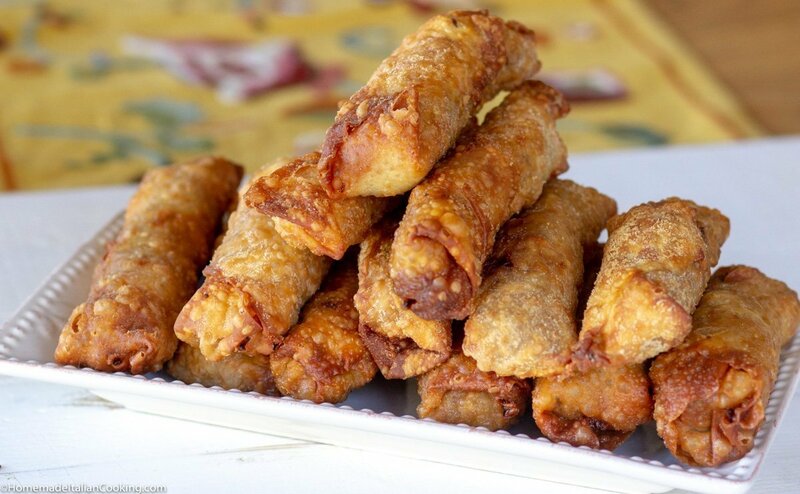 Yes, you can make delicious, crunchy Eggrolls at home! I know it sounds like a lot of work but it’s not hard, and really worth it! Let me give you more reasons to make these Crunchy Eggrolls with Pork & Peanut Butter at home. This recipe makes about 16+ eggrolls. The freeze and reheat beautifully! Seal two eggrolls per freezer bag. When you want a snack just pull out of the freezer, and pop in the oven on parchment paper for 20 minutes at 375F. My personal suggestion is to make a double batch while you have the deep fryer out and stock up or throw a party. 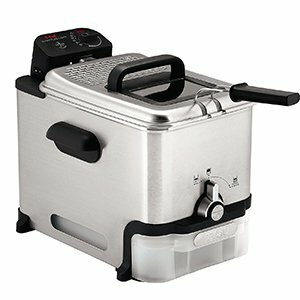 I prefer to use an electric deep fryer (this T-fal Fryer is my fave) versus frying in lots of oil on the stovetop. I like the ability to set the temperature and not worry if its getting too hot. The eggrolls cook faster when fully submerged in oil and does not need to be babysat turning them frequently for an even fry. A deep fryer appliance is also safer and easier to clean up. It does require about a quart of oil. Since I hate wasting food, I always plan to use the oil for several frying batches and recipes before recycling the used oil. (My husband pours the used oil back into the plastic jug, and brings it to a local restaurant that has an oil recycle bin). The frying oil will pick up the flavor of some foods so plan the frying order accordingly. Usually, I fry shrimp or fish last. 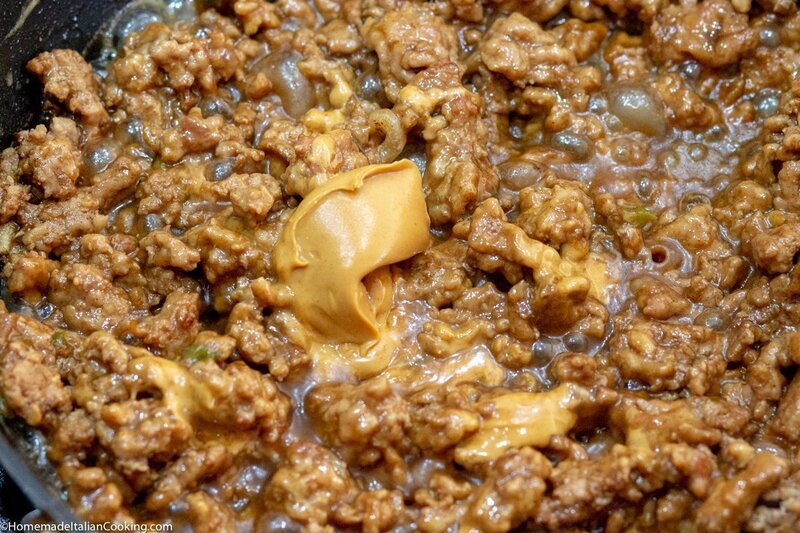 Lightly cook the ground pork, ginger, and spices with the peanut butter. Allow to cool. 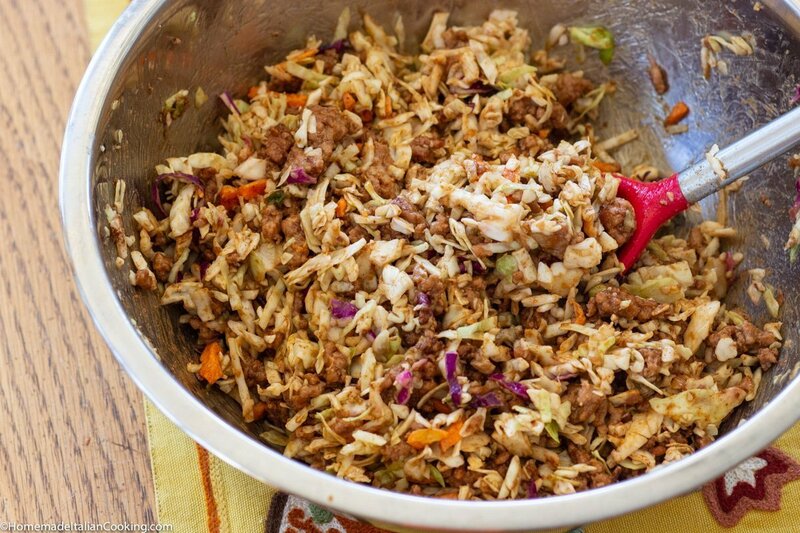 Mix the pork & peanut butter mixture with the shredded cabbage, carrots, and rough-chopped bean sprouts. 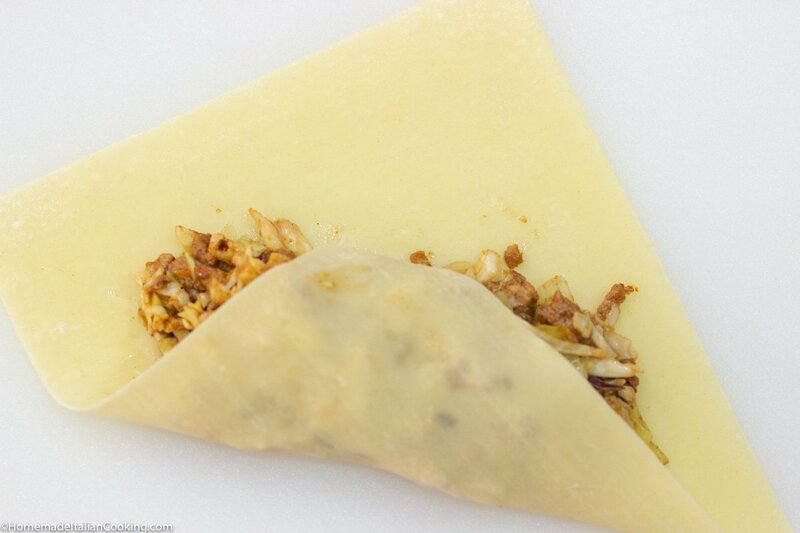 Wrap the egg roll like a burrito on a square eggroll wrapper. Tuck and seal all the ends. The final step is to deep fry for 3-5 minutes until golden. The results are a big platter of hot, crunchy and delicious Eggrolls! Serve with Sweet & Sour Sauce. How many will you have left for freezing? No many I bet. Heat 1 tablespoon peanut oil in a skillet on the stovetop over medium heat. Add the crumbled ground pork and garlic. Stir and breakup the pork until it is lightly cooked and no longer pink. Do not overcook the pork as it will continue cooking during the deep fry step. Add the soy sauce, Chinese 5-Spice powder, grated ginger, and black pepper. Mix and cook for 1 minute. Add the peanut butter and allow to melt into the pork mixture. Add the sesame seed oil last and mix all until evenly incorporated. Transfer the pork mixture to a large bowl and allow to cool for 10 minutes. With a spatula, fold in the cabbage coleslaw mix and chopped bean sprouts to the pork mixture until all ingredients are evenly combined. Add the peanut oil to the deep fryer and set the temperature to 355F. You can also use a combination of peanut and vegetable oil. Prepare a baking sheet lined with paper towels (or a brown paper bag) to absorb the excess grease after frying. 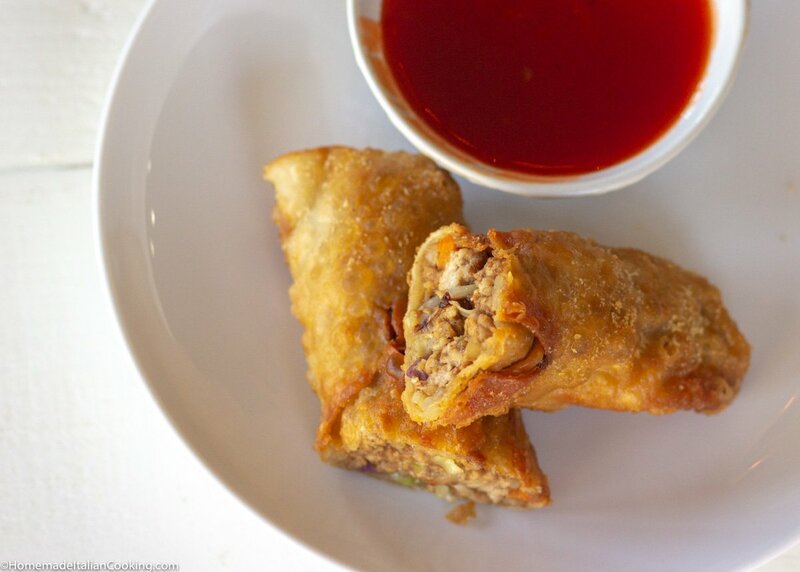 To assemble the egg rolls, prepare a rolling station with the egg roll wrappers, a small bowl of water, and the mixture. 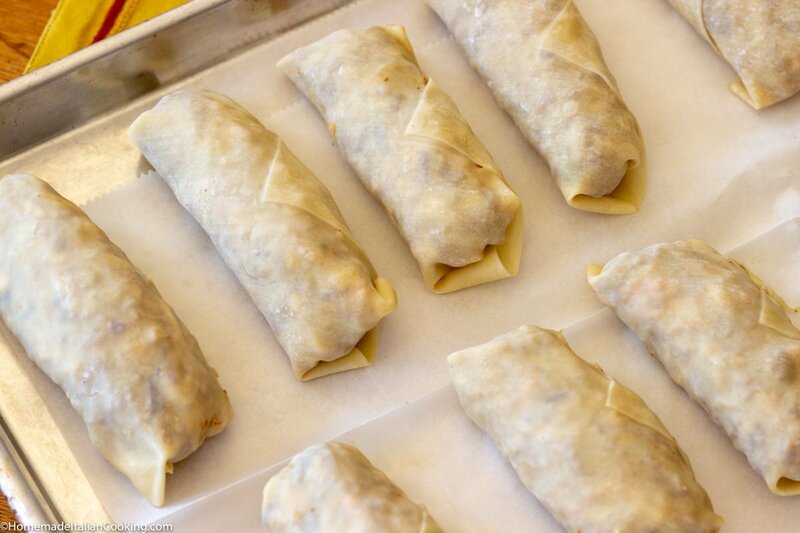 Have a baking sheet lined with parchment to hold the wrapped eggrolls. Place a square wrapper with a corner pointed towards you. With an ice cream scoop, place a scoopful (about 2-3 tablespoons) of pork filling in the center of the wrapper. Fold the bottom corner over the filling, and with your fingers, slightly tuck the corner under and gently squeeze to pack down the filling to make a tight roll. Brush water around the top and side edges with your fingers or a brush. Fold each side end toward the center to seal the sides. Roll the bundle towards the top corner until it is sealed. Place on parchment paper. Repeat until all wrappers are used up. When ready to fry, gently place two eggrolls at a time in the fryer. Allow frying for 3-5 minutes or until light golden brown. You may need to flip the eggrolls with the tongs for even browning. Remove the fried eggrolls with tongs, and hold over the fryer to allow any dripping oil to drain. Transfer the eggrolls to the baking sheet lined with paper towels. Continue frying in batches until complete. Serve with your favorite Sweet & Sour or Duck Sauce. Store extra eggrolls in the fridge for a few days or freeze for later use. Reheat in the oven at 375F for 12-20 minutes.